Matcha Lattes would have to be my favourite drink of 2015. I first tried a matcha latte in September last year and it quickly became my go-to morning drink. At the time, I was looking to reduce my coffee intake and I was wanting something healthy that would still give me my morning pick me up, but with less caffeine. I have 1-2 matcha lattes every day! So what is matcha green tea? Matcha green tea is typically grown and processed in Japan. It contains approximately 25 mg of caffeine per gram, which is around 1/3 of a standard cup of brewed coffee. Matcha green tea is high in antioxidants, chlorophyll and amino acids, namely L-Theanine, which is said to promote relaxation and alertness. It also contains 4-5 times more L-Theanine than regular green tea. In addition to using matcha green tea to make beverages, you can use it in smoothies, raw desserts and baked desserts. My favourite matcha recipes include matcha chia pudding, matcha bliss balls, raw chocolate matcha truffles and raw matcha brownies. I have been using Matcha Premium Green Tea by Kenko Tea, which you can purchase from Optimoz. I have really enjoyed the taste of Kenko Tea’s Matcha Tea and have found that it blends really smoothly in comparison to other brands that I have tried. 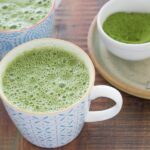 My favourite way to have my Matcha Latte is with macadamia milk and I have included two recipes on how to make it, one is my standard recipe and the other is my super quick recipe for those of you who are short on time. You can also make it your Matcha Latte Bulletproof by blending it with Coconut Ghee. The benfits of adding healthy fats to your Matcha Latte are improved cognitive function, nutrient boost & sustained energy. For more information on, check out Optimoz HERE. Thanks for the tip Rose! So let the boiling water cool a bit then?